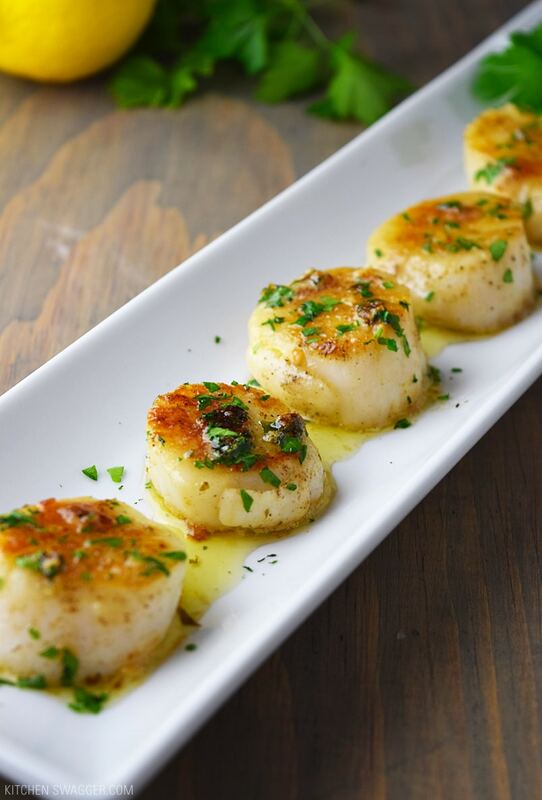 Pan-seared scallops with lemon butter is my favorite way to eat scallops. 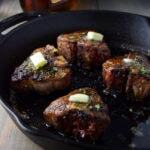 Cooked in a cast iron skillet right on the grill or stovetop. If you don’t have a cast iron skillet I highly recommend you pick one up. 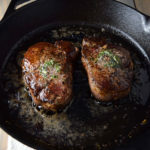 Cast iron is inexpensive and it can be used on the grill, stove, or in the oven. Here is what I use. The secret to getting the golden brown seared edge is to cook the scallops in olive oil on high heat for 1-2 minutes per side. If you cook scallops directly in the lemon butter sauce, it won’t get hot enough to sear the edge. 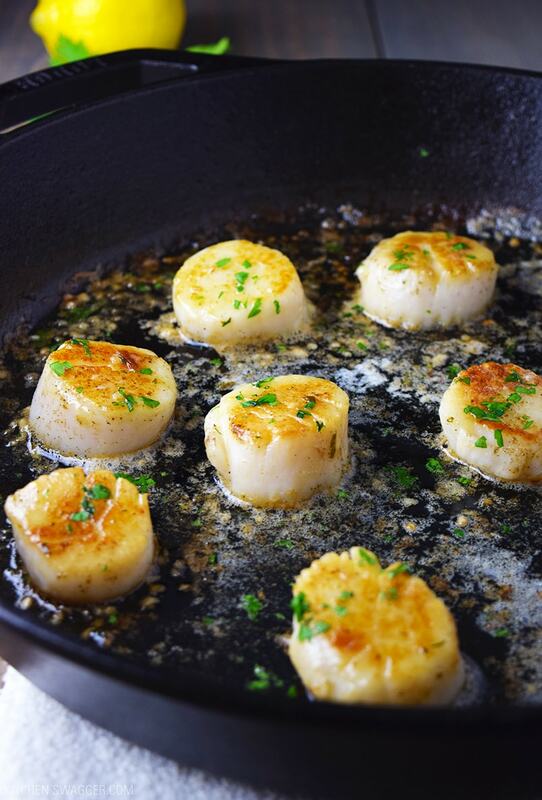 Once scallops are golden brown, remove from the skillet and set aside. Add the lemon butter ingredients to the skillets and stir until fully melted. 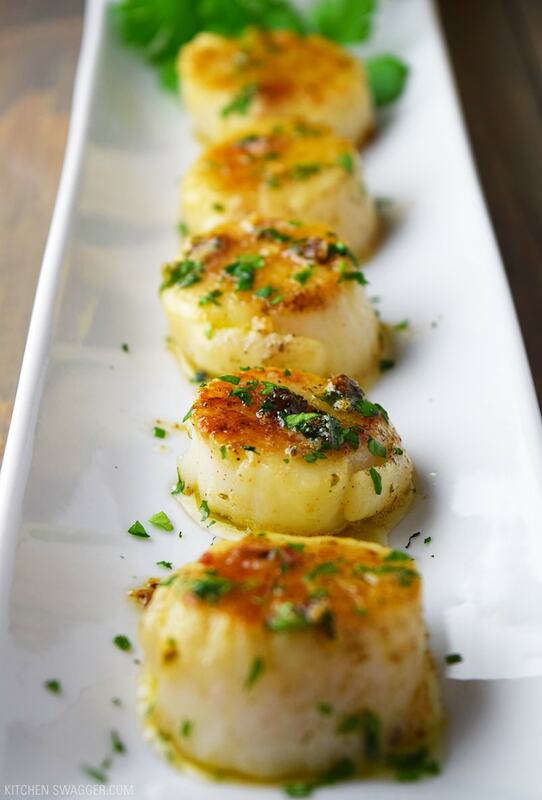 Return the scallops for an additional minute per side and plate with a drizzle of lemon butter. 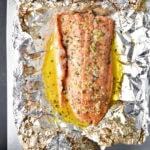 You don’t need to use a lot of butter to get a lot of great flavor, so this is a delicious high protein and relatively light dish or appetizer. 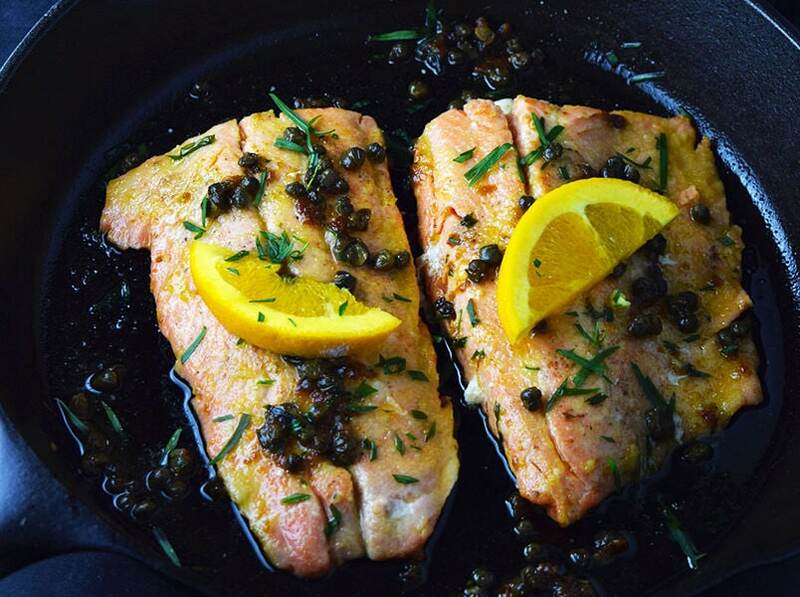 The lemon butter sauce consists of fresh minced parsley, garlic, butter and lemon juice. You can add the garlic to taste or leave it out all together. I typically use parsley but I sometimes will use a little basil as well. That’s it. The perfect gourmet app has never been easier. Pat scallops dry and season with salt and pepper. Mince the parsley and garlic and set aside. 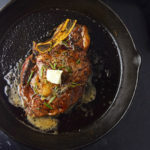 Add the olive oil to a 12 inch cast iron skillet and bring to high heat. Remove scallops from the skillet and set aside. Add the butter, garlic, lemon and fresh parsley to the skillet, stirring occasionally until fully melted. Return the scallops to the skillet and cook for an additional minute per side. 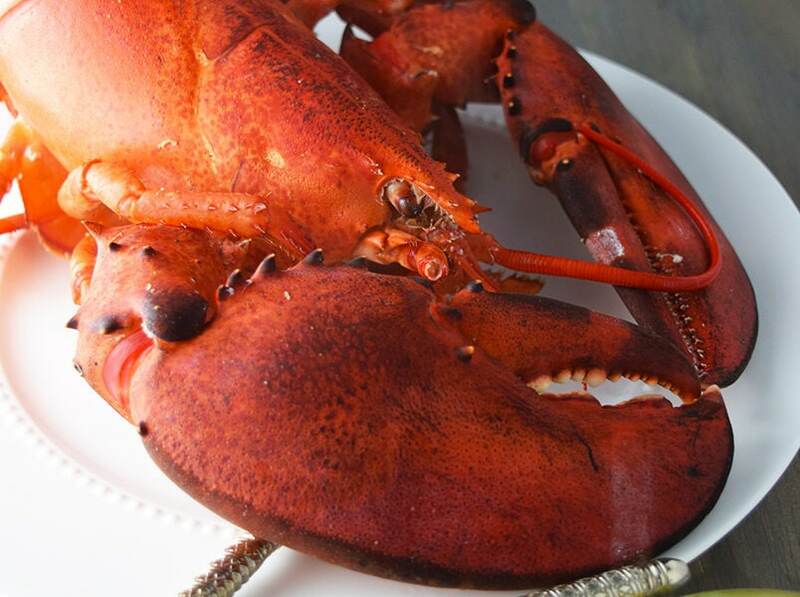 Place on a serving dish and drizzle with extra lemon butter sauce as desired. Sprinkle with a pinch of leftover fresh herbs and serve immediately. I made this and found the pan was to hot for the butter and herbs, I will cool the pan down or prepare the sauce in a separate pan next time, but it was super delicious!! Good point. Sometimes it helps if you add the butter first so it melts and “cools” the pan. Then you can add the fresh herbs. This was my first attempt ever at preparing scallops and all 3 of us here loved it. Thank you. I also need to cool the pan down a bit first before adding the sauce ingredients. I liked your idea of cooling it with the butter. Great! Yes, I need to add a note about cooling the pan here. Awesome appetizer! Thank you for that simple but delicious recipe… The only thing I didn’t do was wait for my skillet to cool off enough and my garlic kind of got scorched. I was being impatient! This was my first attempt and I’ll say I “Nailed It”. I will definitely do this again. Awesome Kristen. Glad it worked out and thanks for note. I may need to rethink the lemon butter sauce part. Making this tonight as an appetizer , sounds delicious and will let you know how I go! So happy we tried this! Really easy and delicious! Definitely 5 Stars! Thank you, Elaine! Glad this worked out well for you. Simple yet elegant recipe. I added a little heavy cream to the sauce and served with steamed asparagus. Visually stunning on the plate and wonderful flavor. If you’re looking for gourmet at home, this is it. I like the extra touch, Robert. can u tell me where the muscle is on the scallops.I never heard of it,so I asked the man that was working in the seafood dept,and he didn’t know either! What kind of side could you serve with this? Trying this recipe on date night! Hmmm anything really. We usually make this when we are doing a tapas night and pair with other apps like mussels and crab cakes. As for sides, how about roasted asparagus, maybe in garlic and olive oil and mashed potatoes? Just had your recipe over cous cous. I like the other people should have let the pan cool down first before making the sauce. It was still good though for my first time making scallops. The scallops were cooked perfectly. Can’t wait to try this recipe, I love scallops but have always been intimidated by cooking them myself, but this sounds almost fool proof! Do you do it differently if you are using smaller scallops. I’ve made this twice now. Both times the flavor was great. The first time the sauce was dark because the pan was too hot and the butter browned. The second time I seared the scallops in cast iron. But, melted butter and herbs in a non stick pan. Presentation was much better this time. Absolutely delicious and easy to make! I used a stainless skillet and it turned out perfectly. Best scallops I have had in years! My husband thought this was the best scallops he has ever had. Cool pan before adding garlic. Delicious and easy to make. Cast iron skillet is a must. I like to cook pasta on the side. After searing the scallops, I remove them to the side and remove the cast iron skillet from the burner to cool a little. Then drain my pasta, prepare the garlic lemon sauce, and pour it over the pasta and scallops. You may wish to grate fresh parmesan at the table. Serve with a green vegetable of your choice. Easy and delicious. 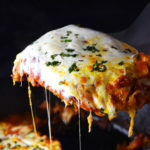 Easy and delicious!! Gourmet meal at home! I served it with Jasmine Rice and Brussel sprouts sautéed in a little olive oil and about a tablespoon of bacon fat with onion and ribboned collard greens. Finished with a sprinkle of sea salt, Plate the scallops over the rice with lemon butter and sprinkle of parsley and a twist of lemon. You look like a gourmet Godess and the best part is that it is SO easy! Those look delicious! 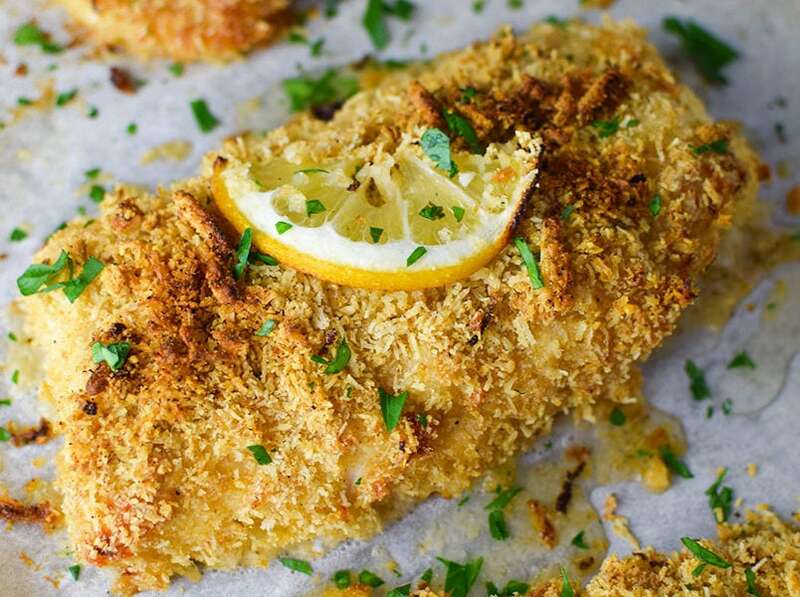 I will be making these for dinner tonight. I’m sure my family would absolutely love these awesome looking scallops. Thanks for sharing!